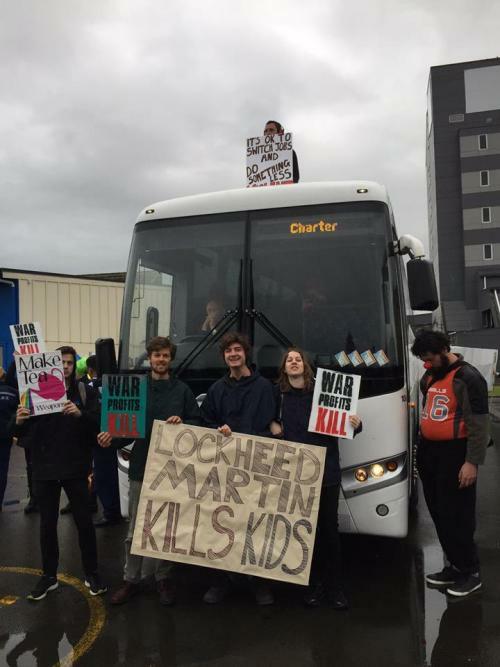 On Blockading – Wellington Socialists. A treatise on NVDA tactics from a Marxist perspective. 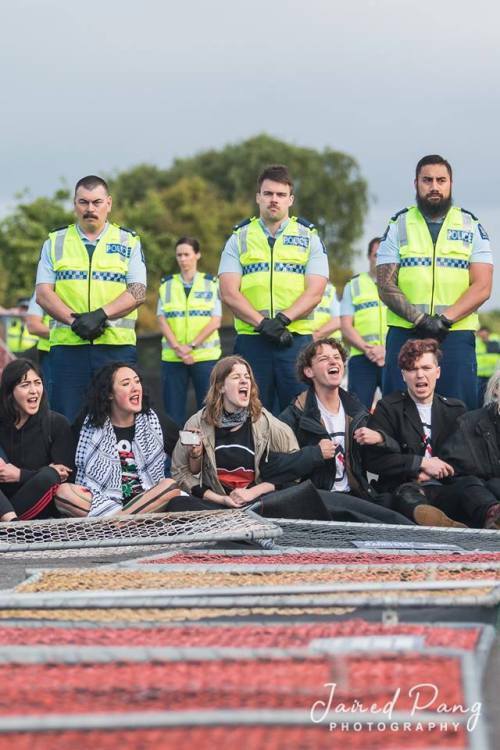 Non-Violent Direct Action is the backbone of the peace movement, but only recently (at least in Aotearoa) have socialist organisations participated in NVDA actions in an attempt to shut down key industries. The peace movement has historically been comprised of a mish-mash of anarchist, catholic worker, Tino Rangatiratanga activists, church groups and other miscellaneous community organisations, and as such, NVDA has become associated with non-marxist tendencies, namely adventurism and pacifism. This has prevented the large-scale engagement of the socialist left with the NVDA actions of the peace movement, but lets look at these critiques closely. The criticism that direct action constitutes an “Adventurism” has its roots in an article by Lenin – Revolutionary Adventurism – that appeared in Iskra in 1902. In it, Lenin denounces the defense of terrorism offered by the Narodnik Socialist-Revolutionaries, who had advocated for a campaign of assassinations against Tsarist ministers earlier that year… Already we can begin to see the false equivalency central to accusations of adventurism, NVDA is obviously totally dissimilar to terrorist assassinations, but lets continue. The central point of Lenin’s criticism is that he refutes the SR’s claim that terrorist activities are able to transfer power from the state to the revolutionaries. He is correct in that it doesn’t follow that blowing up a minister would result in growth of the revolutionary movement, or that that minister’s power would somehow be gained through a destructive act. In this instance there is no transference of power, and so we can begin to see why a critique of NVDA as adventurism formed on the left – can we be sure that NVDA helps to build the revolutionary movement? This is a valid question that we should be asking, but in practice I think it is obvious. NVDA actions are, at their best, blockades of state apparatuses, or private interests that support the repressive apparatuses of the state. If we’re to make private industry grind to a halt, it’s clear that we will need to eventually block the choke points of capital. But before that, do blockades assist in building the movement? It is clear that we can’t jump ahead to blocking off key industries in our tiny numbers, so is there a form of blockade that is effective, not only at wounding the state, but also building our own power? To this I would offer our own experiences as an organisation engaged in NVDA as an example of blockading as a means of building the movement. NVDA, when done well, is not the actions of a small group of professionalised activists, but rather an expression of worker’s sentiment towards repression, it can also weaken the state (by preventing the army and police from effectively operating), build the experience of the organisation for later decisive blockades and galvanise public sentiment against the state (wherever undue repression is seen). None of these statements are true of the adventurist terrorism that Lenin denounced, and unlike the actions of the SRs, our participation in blockades involved a clear transference of power, and came at little cost to our organisations. As socialists, we are rarely pacifists. We recognise that the state, at its essence, is simply the police and army, and as such it comprises a tool of class repression. At a certain point, dangers to the capitalist class will be dealt with with violence, and we can’t fail to defend our friends and comrades simply because of vague moralistic sentiments. That being said, we should recognise that, at the current stage, pacifists have a lot to contribute to the struggle, and we are not yet at a stage where the state can operate unfettered by middle class morality. The media operates as a means for middle class morality to interfere with struggle – and this can either be to the benefit or the detriment of a worker’s movement depending on whether we are seen as active or passive actors in any struggle. Since middle class morality seeks to preserve the status-quo, it values passivity in the face of violence. For these reasons, if socialists are operating in a media-heavy environment, it sometimes helps to be seen as passive victims of police violence. We usually are anyway. That being said, since NVDA often seeks to directly interfere with the everyday operations of capitalism, it is almost never seen as pacifistic by the media. The violence and anger of protesters is emphasised even when it is clear that the police are beating them and not vice-versa. Nonetheless, until middle class morality breaks down completely (as it will in a crisis), NVDA is our only means of direct strategic interference in production and exchange without bringing down the full force of the state on our movement. This is different to the popular conception of pacifism as passivity in the face of danger. In Aotearoa the main site of struggle that involves NVDA is the repeated attempt by peace activists to prevent the New Zealand Defense Industry Association from hosting trade conferences with major arms manufacturers, aviation companies, shipbuilders and private security firms. These forums, colloquially known as the “Weapon’s Expo” have happened yearly, usually in October, ever since the purchase of ANZAC navy frigates in the 1980s. While in 2018, in the face of increasing public scrutiny, the event organisers claimed to not be showcasing any weapons, media access was restricted, and even if weapons were not conspicuously on display, delegates were still free to deal in them, or make profits on innocuous items that could be reinvested into arms manufacturing. This year, despite a distant location, bad weather, vastly increased police presence, road checkpoints, extensive defensive barriers, intimidation tactics and fewer activists, we were still able to shut down the conference for many hours each day using creative tactics. 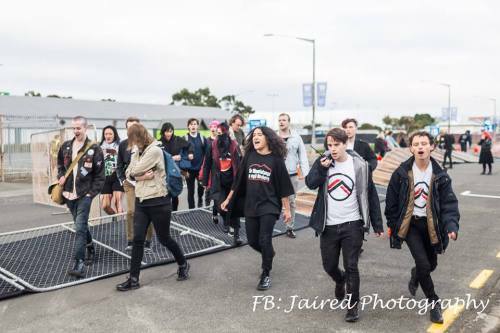 The remainder of this treatise is an exposition and refinement of the tactics used in our blockades of the 2018 Weapons Expo in Palmerston North. I write this both for domestic comrades who weren’t able to attend, and for international comrades who may be able to apply some of our tactics in an increasingly chaotic world. In previous years, blockades were conducted in loose affinity groups centred around contingents from various left organisations. These groups were often uncoordinated, but also very fluid, hard to disperse, and generally able to cause chaos. Unfortunately these tactics were not always effective at keeping activists safe, and the arrest and injury rate at previous years was unacceptable. During the debrief after the first day of blockades, our group reached a number of conclusions, especially after other groups commented on our cohesiveness and discipline. This was because we recognised the need for set roles within the group – namely, a coordinator, a radio operator, and a scout. The coordinator is able to make tactical decisions, the radio operator is able to devote full attention to staying in touch with other groups, and the scout is able to keep an eye on the overall situation away from the action. These three set roles needed to be known by the whole group, and needed to keep their distance from major actions so that they could continue doing their job. The blockade team on the other hand was comprised of activists willing to directly confront police, and entrust any major decision making to the coordinator. This authority was necessary as most NVDA tactics require a lot of discipline so that individuals do not break a defensive line, such as by stepping back from the action without finding a replacement. We found it necessary for all group members to repeat the command as soon as they heard it so that all members could hear the call. We will now go into the tactics associated with the latter two commands. On the first day of action, after pulling down the first defensive barrier, we were confronted with the first police line. This included officers from the so-called “grab squads” who were identifiable by their black gloves, and were tasked with randomised arrests. Luckily, enough of the activists present had been trained in the correct way to lock arms and defend against a police line. Turning away from the police (if you are facing away you’re less likely to be falsely accused of assault), we locked elbows, with our fists facing inwards. Our group split into the blockading team, and the coordinators – the radio op, coordinator and scout – as supporters outside the line were necessary to keep an eye on developments. This formation was effective at preventing the easy arrest of random members (although one was pulled out successfully). However, it cannot hold indefinitely – the police are allowed to touch you, but the lightest tap on their shoulder is grounds for an assault charge. This prevents the line from simply pushing back. Ultimately it is an extremely passive formation that is only good for temporary delays. To truly counter the police line, you must make the police fear that their line cannot contain the crowd. Building up a force of activists on the flanks, while the police are spread out evenly across the road, creates a situation where the police will fear that you are going to be able to push through. In a situation where their duty is to protect something behind them, they will usually retreat to a narrower choke point if they cannot maintain a line. As with most marxist applications of NVDA, it is no longer about passivity – it is about actively making the police have to reconsider their tactics by adapting to changes. The basic strategy is outlined below. In a situation where the police are trying to move a cargo (in our case, weapons company delegates), it is often necessary to stop vehicles in the road. 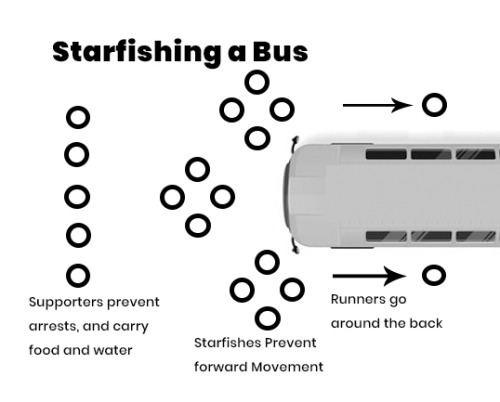 The most effective method of using bodies to block a vehicle that we have found is the Starfish. Although, like many NVDA tactics, it assumes your opponent has a conscience – in practice, the drivers were sometimes willing to threaten the lives of activists in order to deliver the delegates on time. The starfish constitutes four or more activists either sitting or prone on the road, arms interlocked in a circle facing inward or outward. Prone starfish usually result in the police pulling at activist’s legs, while sitting starfish are easier to pull apart at the arms. In order for a starfish to work – there needs to be effective support teams around them. The starfishing action is pretty hard on everyone’s bodies – not only are your elbows, hips or knees on hard bitumen, but police are often pulling at legs, hair or arms. The support team needs to be bringing water, filming police violence, informing drivers of their legal responsibilities (to not put protesters in danger), and keeping an eye on the situation and radios. In addition, support activists must get around the back of the vehicle to prevent reversing. Cars, lock-ons and other actions can all support the starfish. 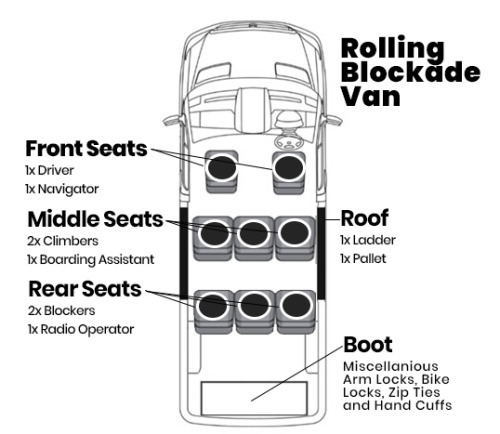 Due to the number of activists involved in a blockade group, it can be difficult to load everyone into cars and keep mobile. Drivers get lost or lag behind, members don’t hear the call to pull back, and generally the group will lose cohesion after a few hours of action. Larger blockade groups therefore were more effective on foot, where they could find strength in numbers, and individual car-loads of activists could not become separated. This also created issues on the first day. Police convoys were able to follow unusual routes to get to the venue, and for a while, the police had the initiative and could choose when and where to confront us. All struggle is about regaining the initiative – choosing your battles and turning passive or reactive action into unexpected action. 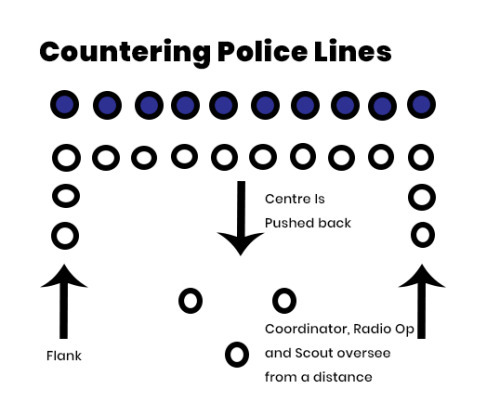 To keep mobile, and to help us strike in locations the police didn’t expect, we found it necessary to create rolling blockade groups, that were centred not on a large group of activists, but rather an eight-seat van. These vans are relatively common, and many activist groups will have access to at least one or two. And from our experience, just one was a very potent force. On the second day, the police forces were gathered early in the morning around the arena. The previous day had been centred around the eastern entrances to the stadium, so roughly a hundred police were patrolling the eastern street. What they did not expect was for mobile blockade teams to arrive at the starting point for their convoys rather than the destination! The van’s objective was to be relayed information on convoys by the scouts to the radio operator, the navigator would plot the estimated movements of a bus, and find a location to intercept it. The driver would approach the convoy as it moved towards the Weapons Expo and block its path forward. In the confusion, the two “blockers” exited the van and blocked the forward and back routes, while the van rolled up alongside the bus. The van was equipped with a ladder, firmly attached to a pallet on the roof. The ladder was lowered onto the bus, where a climber, assisted by another activist holding the ladder and any supplies they might need, would board the roof of the bus. The blockers would then inform the driver that they had been boarded, and it would be illegal to move until they come down. This process is displayed below. The bus, now relatively immobilised, would have to wait for the police to arrive with ladders before proceeding. 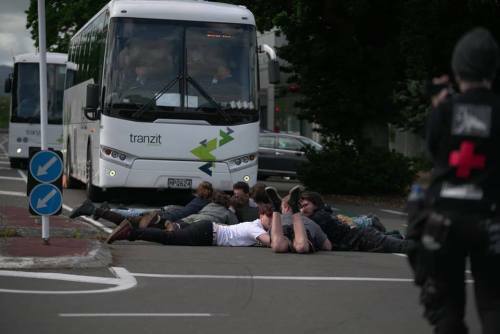 This gave blockade teams the time to get to the bus on foot and prevent any police counteraction. 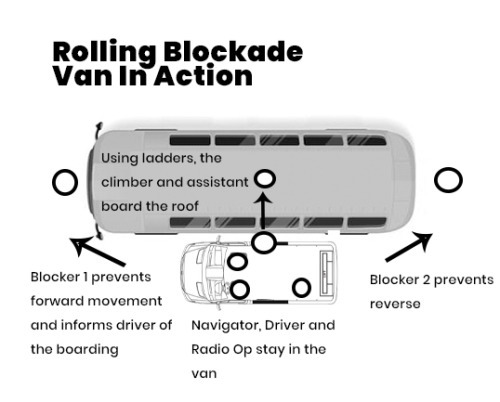 These tactics were more effective than our wildest expectations – for example, just one of these mobile blockade vans was able to stop three buses of delegates (perhaps 120 people overall) from leaving their hotels! All with only eight activists. I hope that this treatise inspires comrades to pursue NVDA in areas where a direct intervention in the apparatuses of capital is necessary to build power and further the struggle. What the people of Aotearoa achieved is truly remarkable and it is doubtful that the NZDIA will be able to continue funding conferences like this in the future. In a world where the state apparatuses will only grow more brutal we need to begin taking action in meaningful ways – not as an individual display of adventurism, but as a mass movement capable of strangling the neck of capitalism in our home. Previous Putting people and peace before profits and war.